1) See I. Mackintosh & G. Ashton, The Georgian Playhouse, Actors, Artists, Audiences and Architecture 1730-1830, exhibition catalogue, Arts Council, 1975, no.93. 2) At 28 Soho Square; J. Boaden, Life of Kemble, I, 1825, p 288. E. K. Waterhouse, ‘Preliminary Check List of Portraits by Thomas Gainsborough’, Wal. Soc., XXXIII, 1953, p 23. E. K. Waterhouse, Gainsborough, 1958, no.161. 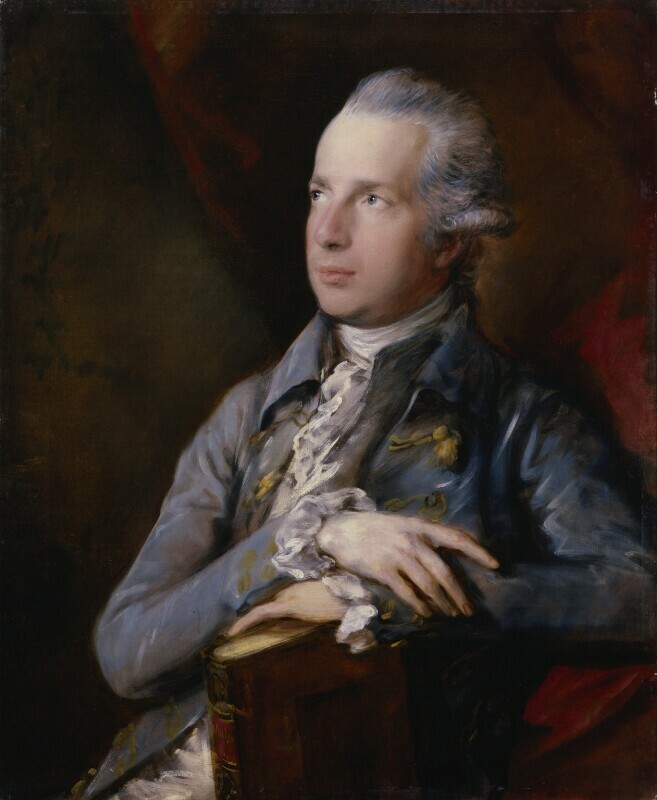 Blue eyes, powdered hair, wearing a pale blue coat with gold trim, grey waistcoat, white breeches; a deep red curtain behind him. Bought from the sitter’s son, George Colman (d. 1836), on 30 November 1836 by Charles Webb;1 John Webb, from whom purchased 1859. 1 As recorded in an old label verso. National Gallery -1920; The Georgian Playhouse, Actors, Artists, Audiences and Architecture 1730-1830, Arts Council, 1975 (93); La peinture britannique, Bordeaux, 1977 (15); Gainsborough, Paris, 1981 (49); Royal Opera House Retrospective, RA, 1982 (196); Treasures from the National Portrait Gallery, NPG exhibition, Fukushima, Nagoya, Kitakyushu HIroshima, Tokyo, 1995-96 (15); Gainsborough, Ferrara, 1998 (18). J. Scott 1874; as a bust-length oval; anon. 1785 (from an original picture by Gainsborough; European Mag.,); J. Hall 1787; A. Smith 1802; T. Cheesman (as after de Loutherbourg) 1807.